When it comes to buying, selling, refining and recycling precious metals, Hamilton Gold is among the leading trusted authorities in the industry with a network of the country’s most trusted neighbourhood gold buyers in communities from coast-to-coast. In Hamilton, Canada Gold offers an easy, convenient and profitable way to cash in your unwanted gold. We strive to offer a convenient, free, no-obligation material evaluation. Hamilton Gold is a family owned and operated Canadian business, dedicated to the highest level of integrity and client satisfaction. Our payout rates for gold, silver, platinum and diamonds are among the highest in the industry because of Hamilton Gold’s investments in state-of-the-art technology. Our mission has always been to provide a reliable and honest way for customers and clients to maximize their return on precious metals. Through community partnerships, a trusted network of specialists, a deep desire to inform and educate the consumer and a dedication towards charitable actions, Hamilton Gold has quickly established itself as a trusted authority in the precious-metals business. Hamilton Gold leads the gold and precious metals buying industry through investments in state-of-the-art testing equipment, transparent testing and purchasing methods, updates and education on the current gold buying market as well as the effects of exploration and mining on the environment. For more information check out the information on this website or feel free to contact us. Hamilton Gold is dedicated to providing honest and transparent service with the highest payouts in the industry. Everything is done right in front of our customers so that they can be involved in every step of the process, and payments are made in person, on-the-spot. We publish our payout rates every day and they are the rates we actually pay! As the first BC Lower Mainland based gold buyers to be accredited by the Better Business Bureau, we are committed to upholding the highest levels of business ethics and transparency. Drop in gold and silver buying service at all our locations – available without appointment! Friendly and in person, we involve you in every step of the process, we operate BBB accredited businesses. You decide which items you want to sell and there is never any obligation to sell. What we quote is what we pay, no extra deductions, fees or refining charges. Price We always pay over 70% and for some items we pay up to 98% of the value for your gold. Often pay you less than 20% the melt value of your gold. Quantity We will buy any amount of gold or silver with no fees – no matter how small. Often pay much less for smaller quantities. Weight We pay you based on the actual weight of your gold and our buyers always explain the test results with the karat number of your gold. Round down to the nearest gram and value your gold for less than its actual purity. Sales Process Visit one of our 11 conveniently located offices across Canada for a friendly, hassle free quote. Require you to send your valuable gold by MAIL (often to the U.S.) and will typically only insure up to $100. Sale Offer No-obligation offer given, based on gold weight and purity tests (conducted with you present). Cheque mailed to you. If you are unhappy with the offer,you must return the cheque quickly and pay for your gold to be returned, with very little turnaround time. Payment By cashable* cheque immediately. Cheque sent in the mail, usually in 2 weeks. Precious stones We pay the highest prices for diamonds. Charge to remove or don’t return gemstones. *Cheques issued by our offices for up to $2999 are cashable at any branch of the RBC with 2 pieces of valid government-issued photo ID. 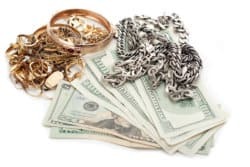 Avoid buyers who refuse to post prices, especially pawns shops and jewelry stores. They frequently offer unreasonably low prices if they suspect a customer doesn’t know the value of their gold. Even if they do post their prices, double-check to make sure that this is the amount you are receiving per gram; we have had many customers report that our competitors pay much less than their posted rates if they suspect that the customer has not seen the posted prices. Make sure you know the weight of your items, in grams, before visiting gold buyers. Then, you will know if their offer is fair. Education is your best protection! Don’t have a scale? You can use quarters or loonies as a reference. Quarters weigh 4 grams and loonies weigh 7 grams. We encourage you to shop around for price and are confident that you will return to us to sell. We frequently shop our competitors and have yet to find an actual offer that is higher than ours. If you have received a written quote from one of our competitors before you arrive, you will find our payouts higher, and if not, we will match the price PLUS 20% of the difference with our 120% guarantee. Read small print carefully. Many sellers advertise their prices only for customers who sell more than $10,000 worth of gold. If you are selling less than this quantity, they will pay you much lower prices. Be wary of any buyer who tells you price ranges, but refuses to commit to a specific price. If they tell you they are paying “$8 – $14 per gram”, you can be assured that you will be offered a poor price after an unpleasant negotiation.